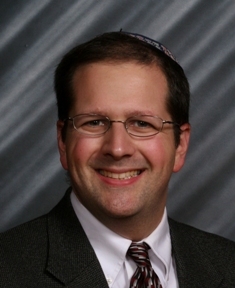 Aaron Ross '92 recently completed his doctorate at Yeshiva University's Azrieli Graduate School of Jewish Education and Administration on the topic of "Motivational Issues in the Study of Gemara among American High School Senior Boys." The study surveyed 112 high school seniors from four New York area high schools in an effort to gauge their motivation to learn Gemara, their affinity for their Rebbeim, possible influences on both of those sentiments, and to see the relationship between love of learning and closeness to the Rebbe. "The results were somewhat heartening," he says, "as nearly 45% of the boys ranked Gemara in the top 1/3 of their classes, with almost 1/3 ranking it as their favorite subject. At the same time, 1/3 of the students listed Gemara in the bottom 1/3 of their classes, a statistic that will hopefully spark conversation as to what we are trying to accomplish with such students." Interestingly, even students who did not have a strong motivation to learn Gemara still felt a certain closeness with their Rebbeim, a finding that may indicate that there is more to Gemara shiur than simply learning the text. He is currently working to expand the research to more schools as well as to girls, in an effort to further clarify some of his initial findings. Professionally, Aaron is entering his 11th year at Yavneh Academy in Paramus, NJ, where he serves as both a Gemara and Chumash teacher as well as the Director of Limudei Kodesh curriculum in the Middle School. In addition, he gives a weekly shiur to high school-aged alumni and has been blessed to maintain a strong and meaningful kesher with many of his students as they have progressed to higher levels of their education (many of whom have studied at Har Etzion over the past five years). He is now living in Bergenfield, NJ with his wife Tzippy, who teaches Gemara and Jewish History at Ramaz. They have five wonderful children - Shmuel Yehuda, Chaya Tova, Ahuva Bracha, Shimon Chizkiyahu, and Tiferet Chana.